Tonight in Victoria, the Vancouver Giants look to advance to the third round of the playoffs for the first time since 2010. The Giants and Royals will take the ice tonight for Game 4 of their second-round WHL playoff matchup. The Giants are coming off a 5-4 overtime victory in Game 3 and hold a commanding 3-0 lead in this best-of-seven series. Altogether the Giants have won five straight playoff games and are looking to become the second team in the WHL to advance to Round 3. Royals defenceman Scott Walford notched two assists in Game 3 and did so while logging the lion’s share of the minutes on the Royals blueline. The 1999-born prospect of the Montreal Canadiens leads all Royals defenders with seven points through nine playoff games and is coming off an all-star calibre season where he potted nine goals and 38 assists for 47 points and a +12. The Vancouver Giants have fired 124 shots on the Victoria goal through three games of this series. Conversely the Royals have registered 45 shots on the Giants goal through three games. That’s an average of 41 – 15. Griffen Outhouse though has stood his ground. He’s managed to maintain a record of 4-2-3-0 with a 2.78 goals-against-average and a .922 save percentage. Carson Miller scored his first goal of the series on Tuesday night for Victoria and is now tied with Dino Kambeitz for the team lead in the playoffs (five goals each). Miller was one of the key pieces acquired in a trade with the Prince Albert Raiders that also saw Kody McDonald come to Victoria in exchange for Dante Hannoun. Miller was the 21st overall selection in the 2015 WHL Bantam Draft. 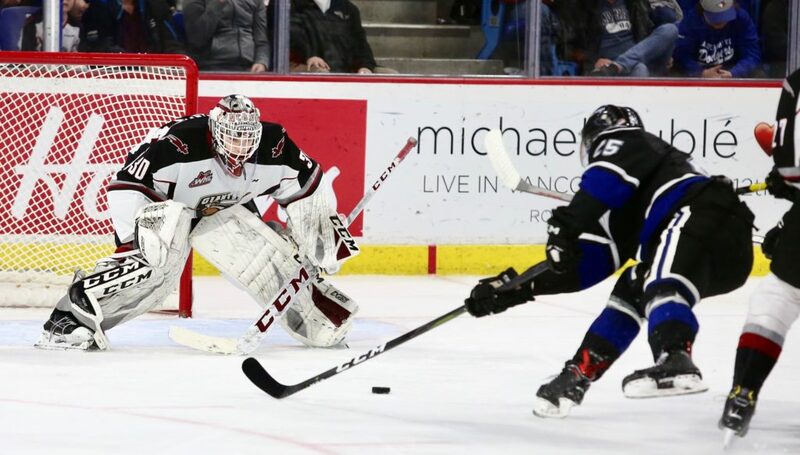 1999-born forward Owen Hardy picked the perfect game to break out offensively in the 2019 WHL Playoffs. Hardy scored twice in Game 3 and added an assist in what ended up as a 5-4 overtime victory for the Giants. Hardy’s goal at 13:34 of overtime marked his first career WHL overtime winning goal. He and his linemates Owen Hardy, Dawson Holt and Jared Dmytriw have now combined for five of the Giants 10 goals in the series. Tuesday night Bowen Byram was named the first star of Game 3 after he posted two assists. He’s recorded at least one point in four of his last five playoff games and in that five-game span has scored once and added six assists for seven points. Byram leads all WHL defencemen in scoring with 12 points in nine games and coming into tonight’s game he’s just one point shy of teammate Davis Koch for the overall scoring lead ing the WHL. The Giants power play has scored in eight of their nine playoff games. Davis Koch comes into tonight’s game with a four-game point streak. In that span he’s scored once and added five assists for six points. Koch has recorded points in eight of the Giants first nine playoff games in 2019. The Giants lead all remaining playoff teams with 35 goals scored in the playoffs so far.